Well, the latest image I wish to share is from Pinocchio's version of Cinderella. While the story keeps the familiar premise of a nice girl being made servant to domineering stepfamily until a fairy godmother enables her to pursue her dream prince, some of the supporting characters seem more appropriate to Disney's Beauty and the Beast, specifically Colonel Mop and Miss Bucket. Also, rather than a grand ballroom, the action takes place on a frozen lake. Yep, it's all about ice skating. 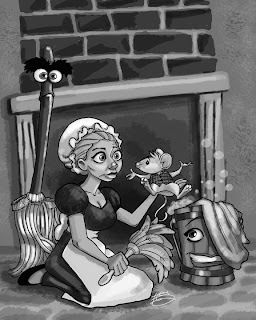 In this illustration, I left the mop alone, finding plenty of humor in the puppet's original design, but I made minor modifications on the bucket and the mouse. Cindy, on the other hand, looks nothing like the marionette. Beating the holiday rush...another post!